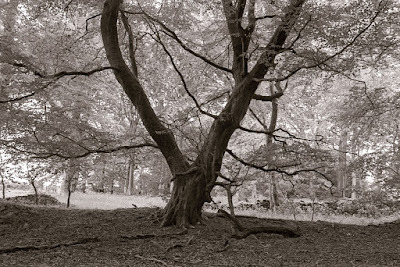 The Online Darkroom contributor, David M., explains in his own, inimitable fashion how to remain upright in the face of converging verticals. Quite often, while we’re out and about with photographic intent, we come across something that we want to photograph, but it’s rather tall and we must point the camera upwards. Pointing the camera upwards makes vertical lines converge. Sometimes we find that we like this dramatic perspective effect, but equally often, we don’t and we’d prefer to see them upright. In these wonderful modern times, we can adjust this in Photoshop by stretching the top half of the image sideways. This works quite well for small corrections but there are penalties; a large correction will visibly reduce the resolution of half the picture and the geometry may not be entirely convincing. Some people are unhappy with this. Before Photoshop was a twinkle in anybody’s eye the problem had already been solved in two ways. Oddly enough, they use the same geometric principles, as you may deduce later. In the darkroom, we were advised to tilt the easel, so that the projected image was distorted back to the “right” shape. Then we stopped well down to make the image sharp overall or, if we had an expensive enlarger, tilt the lens stage in the opposite direction to bring everything back into focus. In both cases, we had to dodge and burn carefully to even out the overall exposure and then work out how to dodge and burn for artistic and creative reasons. The first time we did this, it was a voyage of discovery and excitement. The second time was a pain in the neck, quite literally. But, as an emergency measure, it worked. 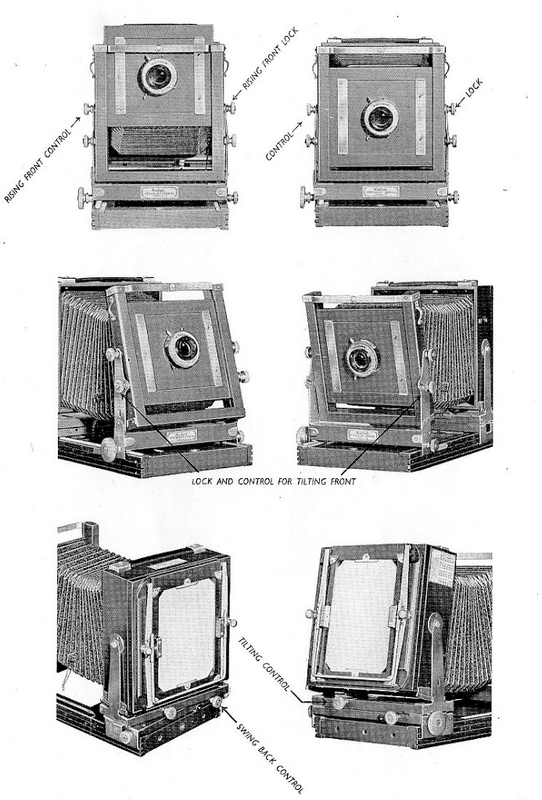 Some popular experts suggested using a very wide-angle lens, photographing the subject with the camera held level and cropping in the darkroom to print just the top half of the negative and discarding the surplus foreground, thus losing at least half of the resolution of the camera and doubling the size of grain in the print. A second method is to retreat to a very great distance and use an extremely long lens. This is not altogether practical, as it radically alters the composition and there may be no suitable viewpoint available. Both are makeshifts at best. Speaking of viewpoints, it was sometimes suggested that finding a window in a building directly in front of the one that interests us, discovering who owns it and getting permission to photograph from their window, is a solution to the problem. Or, like the Bernd and Hilla Becher, we could erect scaffolding. I think we can form our own opinion on these methods. What do we actually mean when we say the camera is level or is pointing upward? Can we do both at the same time? It turns out that we can. Here’s a little experiment that is best performed on your birthday. You will need a birthday candle, a biggish piece of white card and something like the box from your birthday iPhone or Chanel No 5 – something with vertical sides to mimic a building. Darken the room and arrange matters so that the candle casts the shadow of the iPhone/Chanel box onto the card. It will soon seem ridiculously obvious that if the card held is parallel to the box, the shadow will be straight. If you tilt the card backwards, the shadow will take the shape of a keystone but if you move the card up and down, or shift it sideways, the shadow will not change shape although it will lie on a different part of the card. The same thing will happen if you keep the card still and move the candle. You might like to sacrifice one of your birthday chocolates to prop up the box so that it leans forward or backward. The shadow will become trapezoidal, but you can make it rectilinear by tilting the card so that the two are parallel again. My apologies for the childishness of this experiment, but it’s the best way I know to demonstrate the geometric principles without waving my arms. Enough frivolity. We must abandon the fun of jelly and paper hats for the harsh reality of the tripod-face. In simple fixed-lens cameras like Nikon or Leica, when we move the film plane, the rest of the camera goes with it, willy-nilly. This is so natural that we will usually think of it as pointing the lens. Our birthday experiment has suggested to us that keeping the camera level doesn’t really mean keeping the whole camera horizontal. It really means keeping the film plane vertical. If we could move the film or the lens in the way we moved our card or candle, we could easily place any part of the subject on any part of the film and still keep the film plane vertical. What we need is a Proper Camera. We shall need a tripod too. (In the Good Old Days, I might have said a Real Man’s Camera but I know too many women who are better photographers than me to fall into that trap. Coincidentally, I’m writing this as I listen to Professor Dame Nancy Rothwell on Desert Island Discs and if I had any doubts about women’s abilities, this alone would silence me. I like her choice of music too.) Let’s just say a view camera. So here we are, Proper Camera on tripod, dark cloth over our shoulders, standing in front of our chosen subject. We carefully level our Proper Camera so that the back is vertical and adjust the composition. Then, and this is the clever bit, we imagine a line between the lens and the centre of the film – the axis of the camera – and point this axis upwards by sliding the lens itself upward on the front standard of the camera, watching the ground glass as we do it, until we’re happy. Don’t forget that it will be upside down. It’s true that three hands would be helpful, but you must consult Mr Darwin about that. We meter the scene and click the shutter as usual, feeling some private smugness as we watch the owners of Leicas and Nikons wrestle with the problems we have overcome so easily. And if you are photographing something reflective, like a shop window or a framed work of art, you can avoid getting your own reflection in the picture by standing to the side and adjusting the camera in the same way And there we are – all the fun of Photoshop by mechanical means, with no loss of resolution. What could be nicer? 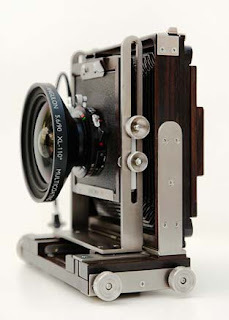 A note for exponents of clever-cloggery: yes, we all know about those tilt and shift lenses for lesser cameras. The principles remain the same: only the price is different. What a pleasure to read a well written article like this! Thank you so much. Johan just beat me to it. Great article David and very easy to understand. All I need is a view camera.